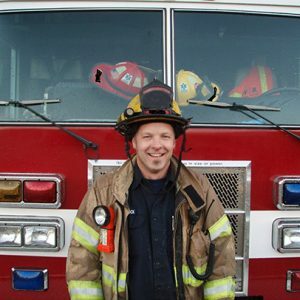 “I’d originally planned to be a police officer, but after talking with a friend decided to be a firefighter and have been doing it for about 19 years. They are both good jobs, but I find this more rewarding. I work with people when they are at a low point in their life whether it’s a fire or an accident. They may have just lost a loved one or are injured themselves. I want to be there to help them. At the same time, this career brings a high rate of PTSD. The work is stressful. You see things that stay with you forever. It’s not something we take lightly. I am counting on my PERS for the lion’s share of my retirement. If it were cut, I’m not sure what I would do. It really doesn’t seem right and I’m not sure how they can do it. There have been two lawsuits already that went on a long time, cost the state a lot of money, and the result was the same both times. The Oregon Supreme Court said you can’t cut the benefits that you’ve promised people. I’m not sure why some politicians in Salem don’t understand how reducing benefits affects regular guys like me.